Additional information: Son of Eugene R. Aiken and Louise R. Aiken, of Kingston, Jamaica. Unit Text: 107 (R.A.F.) Sqdn. Additional information: Son of Miller H. Taylor, and of Marjory Taylor, of Saskatoon, Saskatchewan, Canada. B.A. University of Saskatchewan. See further information by Audrey Elcombe in the addition below. I have longed for a site like this and am happy to add to information on my late uncle Aston Karl Aiken, after whom I was named in 1949. 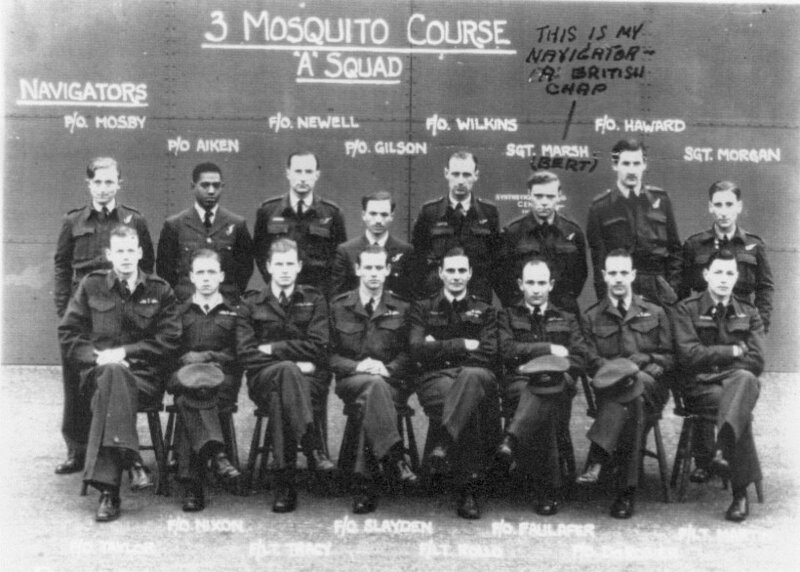 It seems that the record seen by me thus far, is unclear as to how Jamaican navigator F/O Aiken and his pilot F/O Wilburn M. Taylor of Canada died on an operational patrol in their aircraft NS280 (OM-P)on the night of 8th August, 1944. I must first give credit to Audrey Elcombe, a british researcher/writer who provided our family sometime in the late 1980s or early 1990s, with the first printed record of the details of my uncle’s wartime service and clarified for the first time how he died. Some of the information following is taken from her typescript. 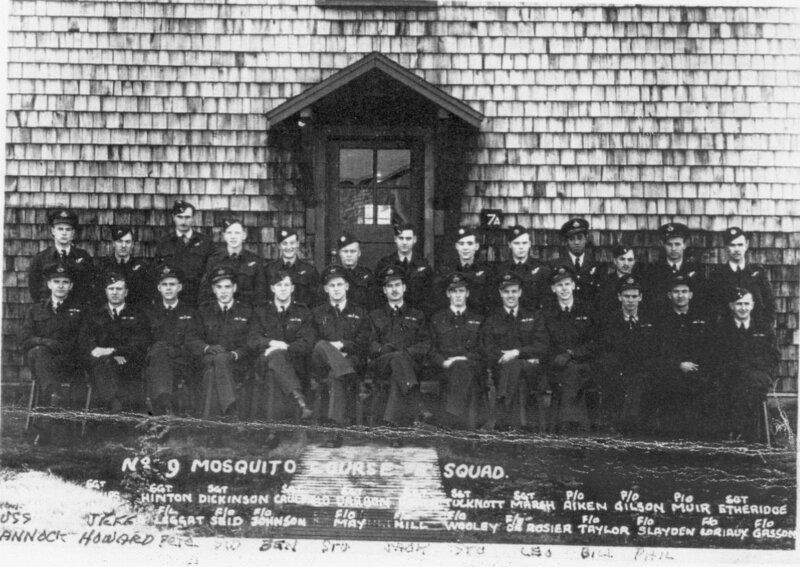 On the night of 7th August, RAF 107 squadron flew nine Mosquito Type VI F/B armed with 4 x 500 lb bombs, machine guns and 20 mm cannon on two routes into occupied France and NS 280 took off at 0215 hrs. Their route followed Villiers-Fonteney-Tressigny-Chartonges-Sezanne-SommeSous-Vitry Le Francois. They were assigned to hit railway sidings and squadron logs suggest that the patrol members put a long stretch of about a mile long ablaze. Canadian records of the loss of pilot Taylor notes that their aircraft “was attacking enemy communications in northern France when it crashed into an electric pole (Taylor was known to be a bit of a daredevil flier and often flew lower than required) and burst into flames 20 miles south-east of Montmiral, Marne”. May I correct an error that has persisted in some records. The ages of the two fliers have been reversed all these years. Aston Karl Aiken was 24 years and F/O Taylor was 29 years old. I would like to add some photographs of my uncle F/O Aiken for consideration for posting on your wonderful website. You may choose which one you wish. Both show him in training in Canada prior to return to the UK for posting to RAF 107 Squadron. Sorry, they dont seem to want to attach. Will try again later. Is there any way I can get these photos to you? Pl advise soonest.